Happy Monday! This last weekend was crazy at our house. My husband's 40th birthday fell on the same day as Easter, so we had an extra big celebration. Right in the middle of it all, our 10 year old daughter was twirling in her new dress, tripped, and fell backwards, breaking her arm. I spent the afternoon in the Insta-Care getting x-rays. (She is going to be fine, although she will be sporting a cast for several weeks.) Who knew twirling in your dress could be so hazardous? 😉We are so grateful for the medical professionals who give up holidays with their families so they can help those that are sick and hurt. Looking through your projects every week is such a source of joy for me. I love all the creativity floating around out there. Thanks for sharing with me! I really appreciate your help in making this party a success, too, so please keep coming back and invite your friends; share via social media. I do repost and repin so please be sure to follow me! Now here's this week's Features! 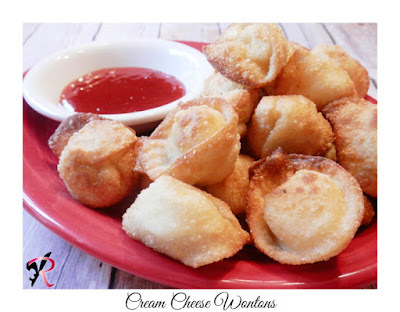 Rae's Books and Recipes shared a tasty recipe for Cream Cheese Wontons, one of my favorites! I can't wait to try it. Yum. KBB Crafts and Stitches shared this awesome Pink Retro Telephone Pillow. 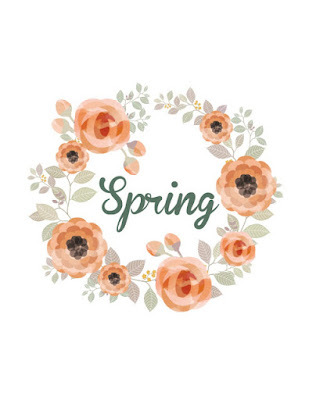 Sprinkled With Color shared some Free Spring Printables. Beautiful! 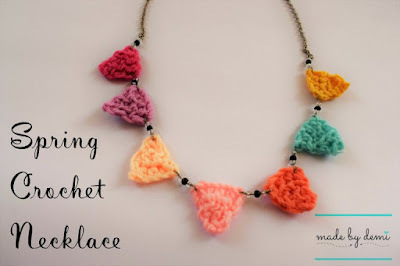 Made by Demi shared this fun Spring Crochet Necklace. I love all the colors! Four Season Family showed us their Stawberry Jam and even made free Jam Tags to go with it! If you were featured, feel free to grab a button from my side bar! Unfortunately, this isn't our first "exciting" holiday either. I'm just grateful for the help! Thank you so much for featuring my crochet necklace!!!!! !have a lovely week!!! 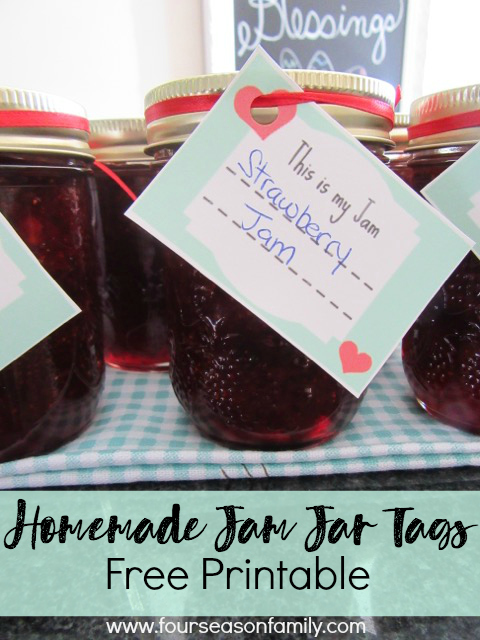 Thanks so much for featuring my Jam Tags! Have a wonderful week! Julie, Hope your daughter heals quickly! Thank you for hosting! Oh, thank you! She's getting her cast today. I'm sure she'll be better soon. Sorry to read about your daughter. I hope she has a quick recovery. Thanks for hosting the party, Julie. You're welcome! Thanks for coming! So sorry to hear of your daughters twirling injury! We once spent an Easter Sunday at the ER getting my son's forehead stitched from a swing collision (the swing hit his head). Thank goodness medical personnel are available 24/7/365! Injuries happen regardless of the calendar! Speedy healing to your daughter! Thank you! Who knew swings and twirling in dresses could cause so many injuries? Kids. Thanks so much for featuring my pink telephone pillow! I love visiting the Bee Party every week. I loved your pillow, so fun! Thanks for coming every week! I'm so sorry to hear about your daughter's arm, like you said, who knew twirling can be that dangerous. I hope she is on the mend soon. Thank you. I hope she'll be better soon, too! Thanks for coming every week, Marilyn! Thanks for hosting the link-up. Have a great week! Thank you so much for hosting, Julie! it is nice to see the party growing!